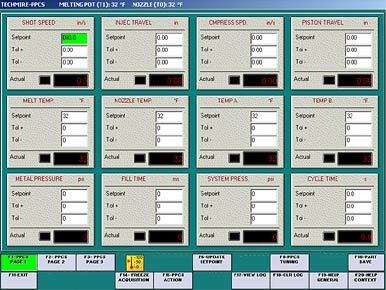 The Techmire process parameters and shot monitoring system (PPCS) permits the machine operator to set specific values for over 25 critical production parameters (e.g., temperatures, injection speed, and fill time). Each process parameter can be programmed with upper and lower control limits. 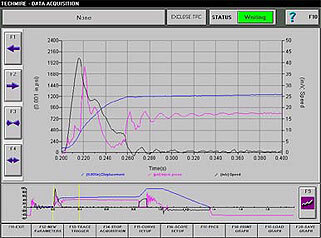 The shot monitoring portion of the PPCS is an excellent diagnostic tool for operators and process engineers. Graphs of shot profiles can be reviewed in real time on the machine controller or at a remote station linked to the controller via a network. These critical parameters can be automatically transferred in a database onto a remote computer. The data can be transferred after each injection or once per day. In the event that an out of tolerance condition is detected, the PPCS can be programmed to take a number of actions, such as setting off an alarm, stopping the machine, or directing the components produced to a separate bin, for later inspection. (The machine has a directional palette for this purpose.) All out-of-tolerance injections are logged with their respective parameters for subsequent analysis.